Oh lord, let it not be waheed. The tempo went a notch higher and I pressed my head deep into the pillow, pretending to be dead. Where did he learn to pull this kind of stunt, anyway? Wos! They should allow me pass my MBBS first o, before they turn me to emergency doctor. I was still lost in thought when Tiwa re-entered, a sunken expression on on her face. Then, it hit me that what Waheed meant was that his madam was sick. 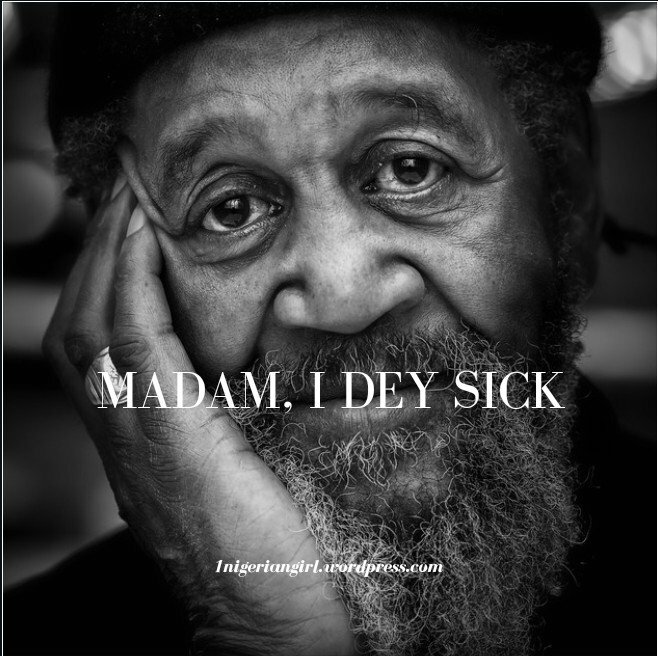 Madam, I dey sick. Iya mi is what everybody calls her, my mother, that is. It stemmed from the Saturdays she would come to the hostel bearing bowls of ewedu and everything nice, like man, everywhere stew. She would bless the girls that would come to my room to hail her, with minted cash – My mother doesn’t know her age, playing with my small small friends, but they loved her and she looked forward to the Saturdays I let her come because really, there was nothing for her to do in our big house. Only then did I look down and see the blinking lights, Dad. This brought a chuckle to my face. I was never one of those people who resorted to prayers for any and everything. I mean, look at me, Omoshalewa Fakorede Ademipoju, do I look like I have problem in life? I’ve had everything I can think of, we were never one of those Bible thumping Christians, we were Sunday-Sunday people, even if the Sundays were far apart than they were near. Well, now, I’ve said more prayers than I can count, as mother goes in and out of the theater. The smell hit me first, of old cars, heat and cheap air freshener. Waheed came with an old car. The one with the faded stains from the time Iya mi was rushed to the hospital early in the morning because her water broke – I was six and didn’t understand why she couldn’t just take another water from the fridge. The same Mercedes used to carry Kola to the mortuary the time he just stopped moving in his sleep, he was six months. I lost my only chance at a brother and a sibling. The doctors said it was fibroid, at first. Then, they said it was cancer. She would use her best impression of Funke Akindele’s voice from the hit Tv series, Jenifa. Like I said, mumsi doesn’t know her age. That would be the perfect moment to bill her, for the trip to Tarkwa Bay, the shopping spree in Dubai or the meet and greet with Leo Da Silva. The sad face always works, issi nor my mother again? Now, she looks old, 60 to her actual 45, and her hair is falling out in places. Clumps and clumps of afro on the bed every morning. Daddy is too busy to even come see her, the doctors update him directly. If my only empire, my mother, should fall, I will not forgive him. The ride was uncomfortable. I wanted to sit in front, allow the breeze blow through my hair and pretend to be lost in thoughts, as they do in the movies. Daddy would not hear of it. Well, I’m in the owner’s corner, boiling with heat because I can’t open the window for security reasons and arguing with my boyfriend on whatsapp. Amin is beginning to stress me. I know he’s only with me because my father can get him that job in LIRS after service. What I don’t get is, why instead of trying to please me and do everything I want, he still chooses to stress me. This kind of beggar that used to have choice sef! Now, he’s angry because the money I sent him is short 50k. I don’t blame him Sha, we pluck money from a tree in our backyard. It’s myself I blame. I know what you’re thinking, why have I not dumped him? He’s a fine boy, and I’m not a daughter of chimamanda, I’m sure I can manage. I don’t like the number six. I was six when the Mercedes got stained. I hated that Mercedes. I was six when my brother died in his sleep, he was six months old. I hated kids after that. When the Doctor came into the ward and gave me that look, I checked my phone clock and it was six pm. I knew something had happened. Something was wrong. The machine was beeping in a different tone now, slow and sorrowful. I could no longer hear the slow drag of mother’s breath as she slept. There was a cold silence everywhere, and all eyes were on me, as if waiting for permission. I nodded to them and they covered her face with the white sheet. Her hand was still cold as I clung to it, my last memory of her. My mind flashed back to the times she would beg to come to my school to chill with my friends and I.
I would say no, of course. I was a cool kid, not a mummy’s girl. Now, I felt guilt, for all the times lost. For the times I didn’t know she was struggling with an illness, because I was too engrossed in trying to pass medical school. I’m not sure I even want to be a doctor anymore. I hate hospitals and Doctors couldn’t save my Ma. Father was still in one of his several meetings that seemed to occupy his time these days. The doctor would break the news to him, as usual. Oh my! So beautifully written. I’m so sorry for your loss! Phew thank God! I wanted to ask but then I was like lemme not be rude. #newfollower. You write so well! Well, love this tragic story as I learnt a lesson from it that we should try to make an impact on people’s life B4 u re gone to avoid regrets like this small girl regretting not making out time with his mum because she wants to be the cool girl and not the mummy’s girl. Anyway, Nice write up, keep it up. Such a lovely read ! !